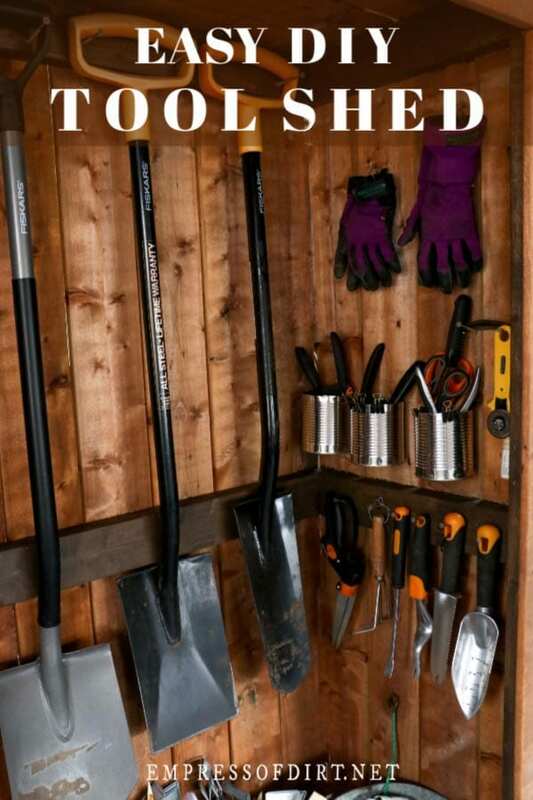 Want to keep your garden tools sorted and ready to go? 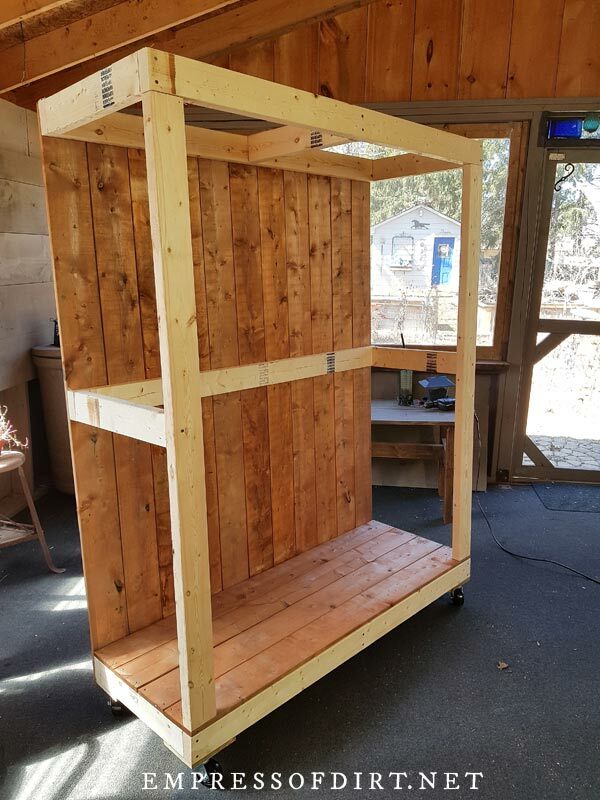 This DIY tool shed on wheels takes a couple of hours to build and can be customized to suit your needs. For more DIY projects, be sure to see the Make section for creative and functional ideas. I’ve been wanting to build this for a long time. While I’m not a neat-freak (simply because there are too few hours in a day to have that ever make my priority list), I do love the idea of everything having a place, both in the home and garden, so it’s easy to find. Let’s start with the problem, and then I’ll show you what I did. Yes, that’s a mess! Once I knew better days were coming, I let it go. That item on the lower left is an old school fountain, in case you’re wondering. It’s going to be a mini water garden, eventually. But the mess is real. 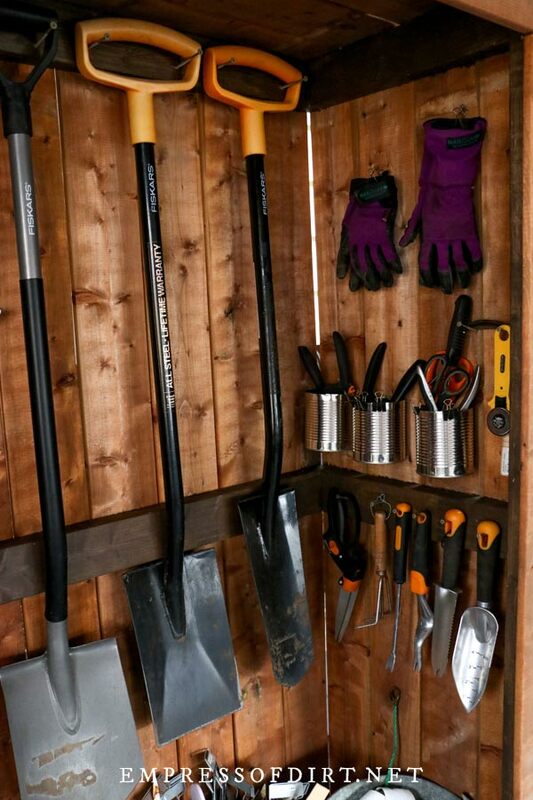 1 Gather all your garden tools in one place. Everything from lawn mowers to loppers. For me, I had to separate sentimental old favourites from newer, more efficient items. You just want the truly useful, functional stuff to take up prime real estate in the tool shed. 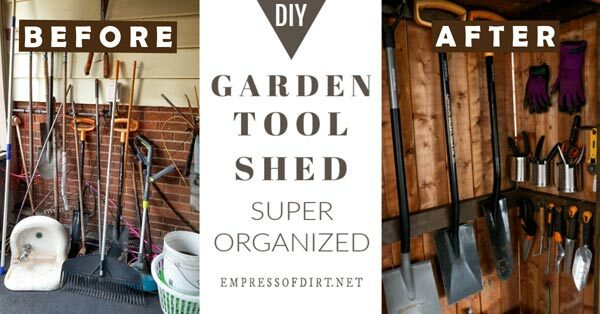 1 Garden tools I use all the time. Your shed is coming! 2 Ugly garden tools that don’t work well. Life is too short for these! 3 Old favourites that look cool but don’t work well. Hello, garden art. Groups 2 and 3 were set aside (for future projects) and I sorted Group 1 for the shed. It really helped to lay out all the keepers on the floor in logical groups (pruning, cutting, digging, tagging….) 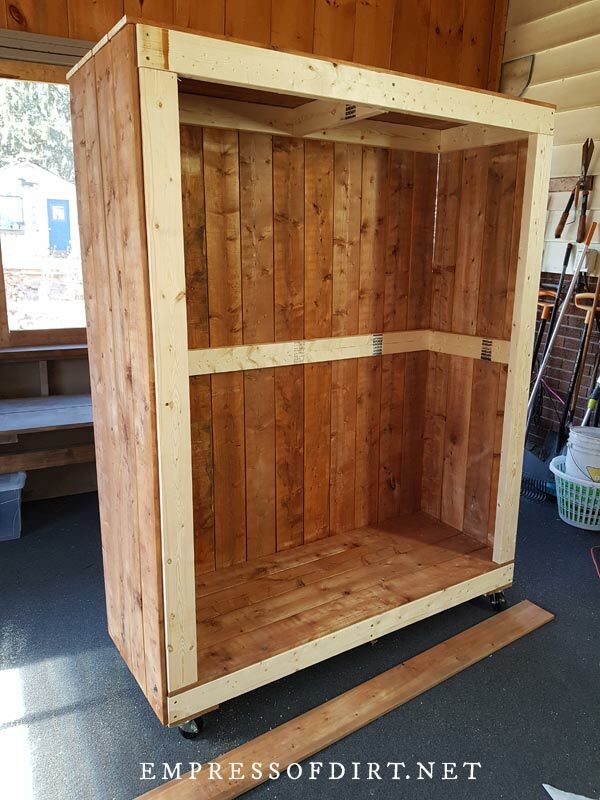 to get an idea of what the shed needed to accommodate. 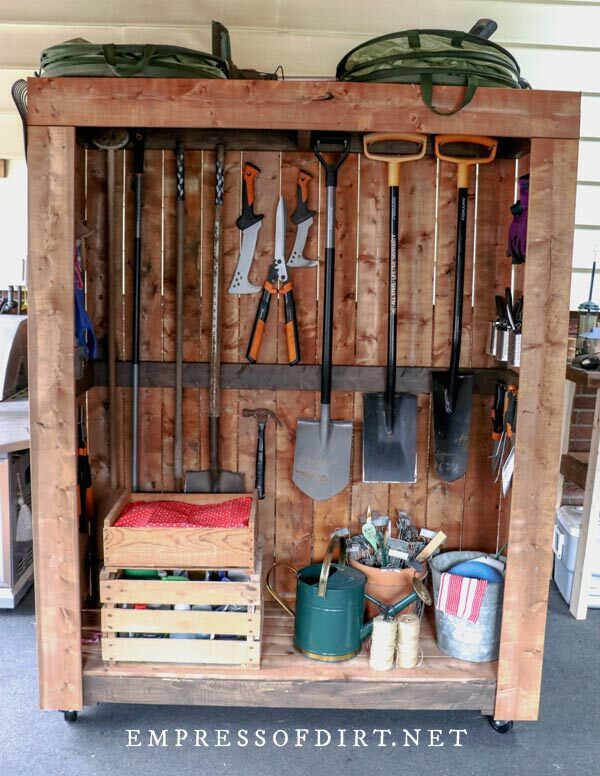 I decided the shed would just be for hand tools, plant tags, gloves, and other small items. The lawn mowers and flower pots are kept elsewhere. The worst is building something nice and then finding that it really isn’t functional or your stuff doesn’t fit nicely, so it really pays to plan it out ahead. After doing the basic layout, and allowing room for future additions, I had an idea of the desired size and layout of the shed. The entire project including construction and hanging the tools took approximately 4 hours. 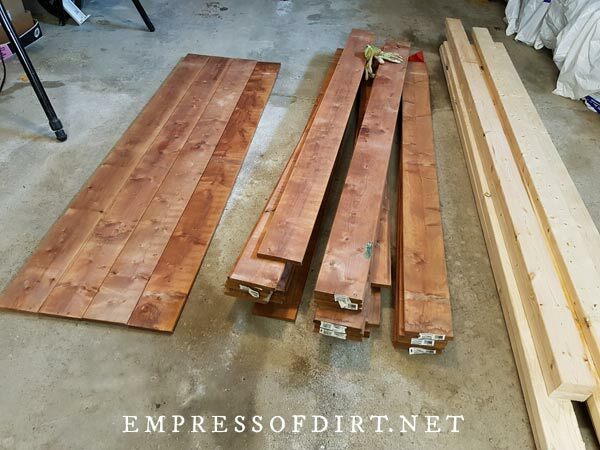 Once I knew how much space I needed for the tools, I planned the shed based on the dimensions of the lumber. This avoids wasteful cuts. 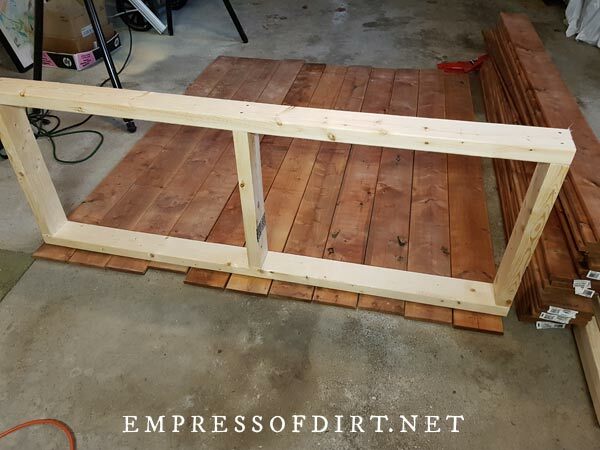 I used 1x6x6 fence boards and 2x4s for the frame. I made two identical frames: one for the base of the tool shed, and one to support the top. I also had a problem I’ve never had before: some of the fence boards were not the same width, and I didn’t discover this until it was too late to adapt without major rework. So, my advice is, double check the size of all your boards to be sure they are the right size, or adjust your building plan accordingly. I apparently scored some shrunken and over-sized ones! In this next photo you can see the base frame. It should be the width of the fence boards minus the thickness (x2) so that the corners can overlap. (I couldn’t do this because of the unexpected off-size boards). 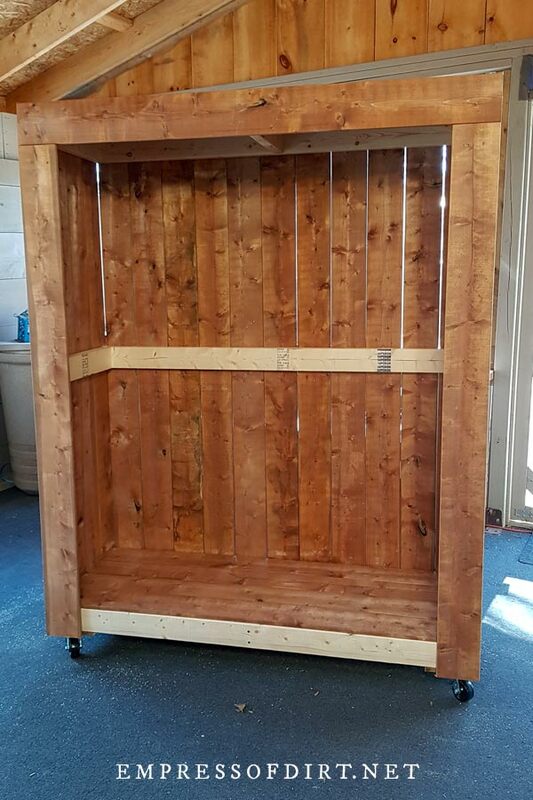 If there is any chance you’ll want to be able to move your shed around or keep it off the ground, add wheels. Castors are sold by the weight they can hold and some have locks. The ones with locks are way too expensive here and it’s not essential, so I went with the plain ones. 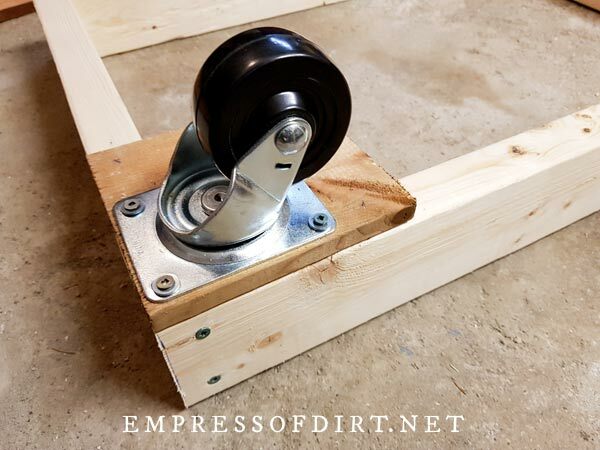 This DIY workbench has the same basic structure with the wheels. The base frame forms the floor of the shed. The floor boards are added before the walls. In addition to the top and bottom frames, I used 2x4s vertically on either side at the corners, and horizontally, around the sides and back. In the next photo, you can see I have attached the back and side boards. That’s when I discovered I had some wrong-size boards (varying widths) but I just carried on. My tool shed is staying on a covered patio so it’s no big deal. I used the same boards for the flat roof. My long-range plan is (maybe) to add some doors to the front, to hold more tools inside them, but, for now, there’s lots of storage room and I like it open. I later stained the raw 2x4s with walnut stain, and then it was time to hang the tools (fun part). 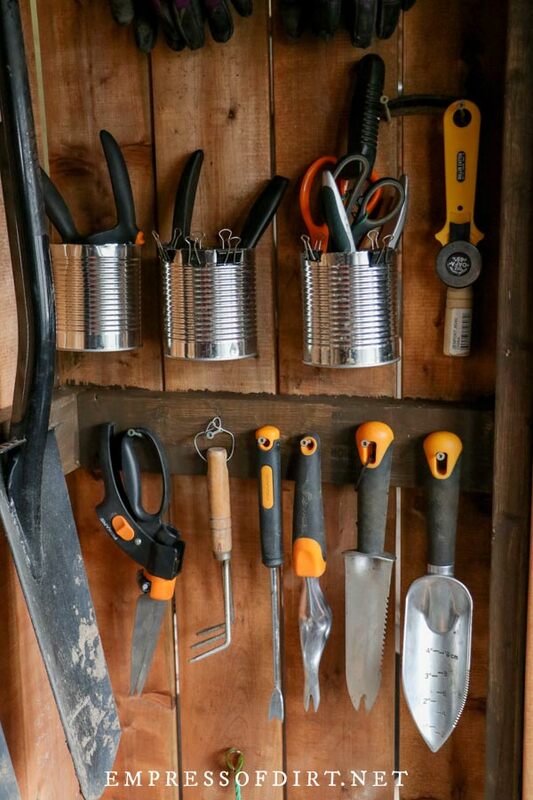 Here’s the shed with the tools hung up. I debated using special hangers or peg board but everything seemed so fussy and pricey so I went back to Plan A and used wood screws as hangers. 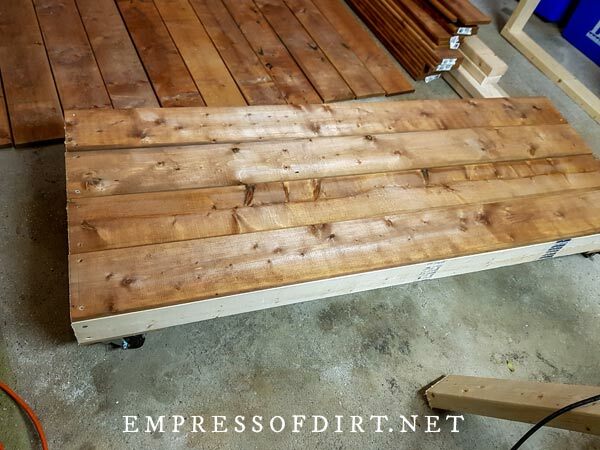 If this was going outside, I’d add battens to close the gaps between the fence boards since they will shrink over time, and slope the roof. Another bonus of having the tool shed in a protected space is the ability to hang items on the exterior. I have one very large rake on one side, and my kangaroo bags (a top favourite must-have tool) on top. So far it’s been great. 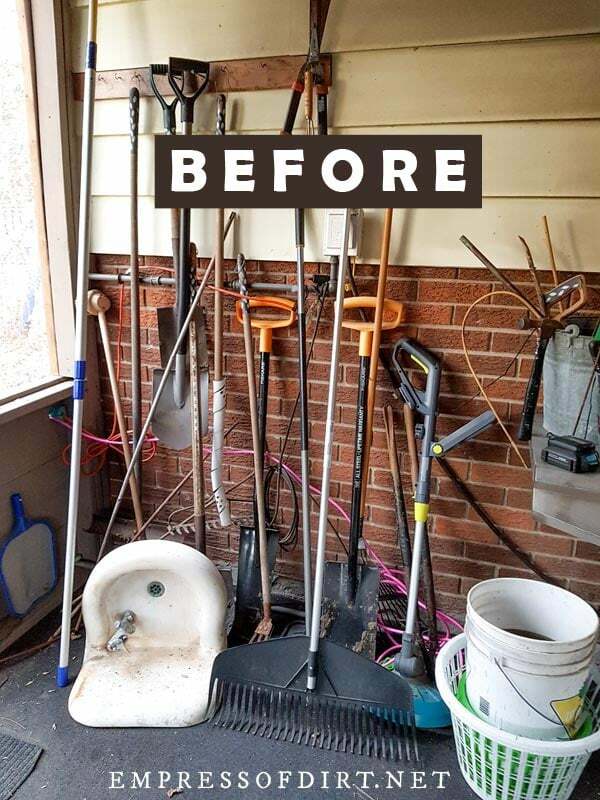 It looks good on the covered patio, I can quickly find exactly what I need, and everything has a place so tidy up is easy.